As summer winds to an end here in Vancouver, we welcome back the cool breeze of autumn and prepare for the snows of winter. Even though the sunshine may not be appearing as much around Vancouver, autumn is the perfect time to explore the many trails and parks surrounding the city while being sheltered by the beautiful canopy of changing colours. Immerse yourself in Vancouver’s vibrant coastal temperate rainforest by hiking some of its best trails through the eyes of a Vancouver native. Just don’t forget to bring a rain jacket! As the crown jewel of Vancouver, Stanley Park has been hosting and inspiring locals and visitors alike since its creation in 1888. 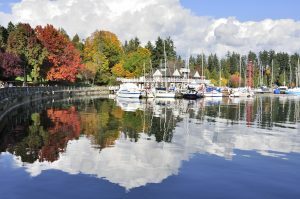 Named after Lord Frederick Stanley of Preston, the sixth Governor General of Canada, Stanley Park boasts many activities and amenities including the Vancouver Aquarium, Brockton Point, Second Beach and more notably, the Stanley Park Seawall. The seawall stretches for 9 kilometres/5.5 miles around the perimeter of the park, snaking next to the shimmering waters of Burrard Inlet and English Bay. It offers arguably the best view of the skyline of Vancouver’s downtown core as well as the North Shore Mountains, all on one multi-use path. The Bigleaf Maple and Black Cottonwood trees that border the seawall create a beautiful collage of colour as they bask in the autumn air. Other highlights include Siwash Rock, the Girl in the Wetsuit statue, and passing underneath the famous Lions Gate Bridge. The seawall isn’t the only pathway that showcases the grandeur and beauty of Stanley Park; a huge network of trails cuts through the centre of the park amongst Western Red Cedar and Douglas Fir groves. 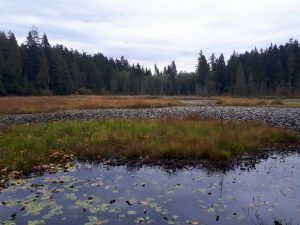 Beaver Lake sits in the middle of Stanley Park and is a worthy destination. 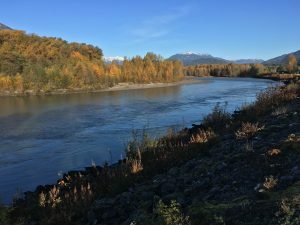 The lake’s surrounding environment showcase a range of flora and wildlife including salmonberries, sword ferns and its namesake beaver family. Access to Beaver Lake can be gained from a multitude of trails but is easily reached from Pipeline Road or the Ravine Trail. The #19 bus, which can be caught along Pender St. in downtown Vancouver, travels into Stanley Park and stops along Pipeline Road very close to the lake. 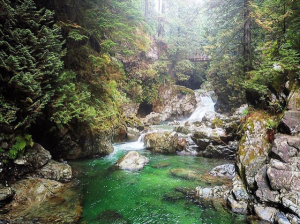 Located on Vancouver’s beautiful North Shore, Lynn Canyon is a stunning destination that showcases a quintessential British Columbian rainforest. The canyon itself features steep cliffs, gorgeous waterfalls and thick moss that hangs from precarious alcoves. A series of trails follow the rim of the canyon and attain destinations including the 30-foot pool, Twin Falls, and the main attraction, the Lynn Canyon Suspension Bridge. Entering the park is completely free. However, keep in mind that Lynn Canyon can be extremely dangerous, especially during wet conditions. Stay on the marked trails and reference the onsite maps highlighting the distance to various destinations. Upon arrival, start walking past the first parking lot, you’ll come across the Ecology Center on your left and a café on your right. The Ecology Center is worth browsing to learn about the local plants and animals. The suspension bridge is immediately across from the café. Once across, you can take a left turn which takes you to the pristine, calm waters of the pool. Or, you can take a right turn which takes you to the aptly named Twin Falls. Walking out and back to either destination will take about an hour. Lynn Canyon used to be a local secret but has since become increasingly popular with both locals and tourists. It’s easily accessible by public transit; from Lonsdale Quay in North Vancouver, which can be reached from Downtown Vancouver via the Seabus from Waterfront Station, take either the 228 or the 229 bus to Lynn Valley Center. From there, you can either take the 227 bus or walk the 15 minutes up Lynn Valley Road to Lynn Canyon. There is also plenty of parking in the park if you’re driving there yourself. Quarry Rock in Deep Cove, North Vancouver, is another classic Vancouver hike. The trail to Quarry Rock traverses a gorgeous forest that sits on the north side of Mount Seymour. Huge deciduous trees dominate the landscape and the waters of gurgling streams bounce off the mossy rocks. Once atop Quarry Rock, a unique view of Deep Cove presents itself. Despite the geographic solitude of this granite summit, somehow, you’re only 2 minutes away from Vancouver. It’s true that an inordinate amount of people frequent Quarry Rock in the summer months. However, it is a worthy autumn destination because of it’s amazing views and varied landscape. The autumn season is also sure to dissuade many parties from heading out onto the trail. At the Gallant Avenue and Panorama Drive intersection in Deep Cove, the trailhead is 500 meters north on Panorama Drive. 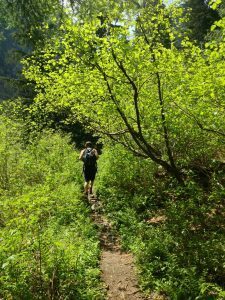 The trail to Quarry Rock starts on your left and is on the first section of the Baden Powell trail, a 48km/30-mile-long trail that traverses the entire North Shore. Continue following the blue and white Baden Powell markers for another 2km through undulating terrain until you reach the magnificent viewpoint. Round trip, the hike should take between an hour and a half to two hours to complete. Taking public transit to Deep Cove from Downtown Vancouver takes about an hour but is easily doable. From Lonsdale Quay in North Vancouver, take the 239 bus to Phibbs Exchange. From there, take the 212 or 211 bus to Deep Cove. There is also ample street and public parking in Deep Cove. Once you return from the hike, don’t forget to stop at Honey’s Doughnuts and Goodies in Deep Cove. Try the maple-bacon doughnut if available! Autumn is a peaceful and charming time of the year in Vancouver. Nowhere else is this change felt more than the trails and forests that encircle our marvellous city. There are plenty of other places to explore besides the ones mentioned above. Happy exploring! Always remember to prepare when venturing out into wilderness areas. Bring food, water and clothing and tell someone where you’re going and when you’re expecting to return. Autumn in Vancouver also means shorter days, colder temperatures and more difficult trail conditions. Visit the Adventure Smart website to learn more about trip planning for any hike. Visitors to Vancouver have a lot to choose from when they visit this picturesque city: what to see, where to go, and what to eat. Visitor blogs and books are filled with the must-sees and -dos while visiting Vancouver, and Capilano Suspension Bridge Park and Grouse Mountain are almost always listed. These attractions are in North Vancouver located north of downtown Vancouver across the Burrard Inlet, only a 30-minute drive from downtown. However, not every visitor rents a car when they visit Vancouver because it’s not always needed in such a walkable city. Ways to get to North Vancouver to visit either the Capilano Suspension Bridge Park and or Grouse Mountain include public transit, shuttle service offered by Capilano Suspension Bridge or Grouse Mountain, or with a sightseeing tour. All of these are great options, however, taking a sightseeing tour offers many benefits that the other options may not. Below are the top benefits of taking a sightseeing tour to North Vancouver. Capilano Suspension Bridge offers a free shuttle from various locations across downtown Vancouver which is a great way of getting to the attraction; however you may have to wait in line because the shuttles come around every 15 minutes and they may be full! 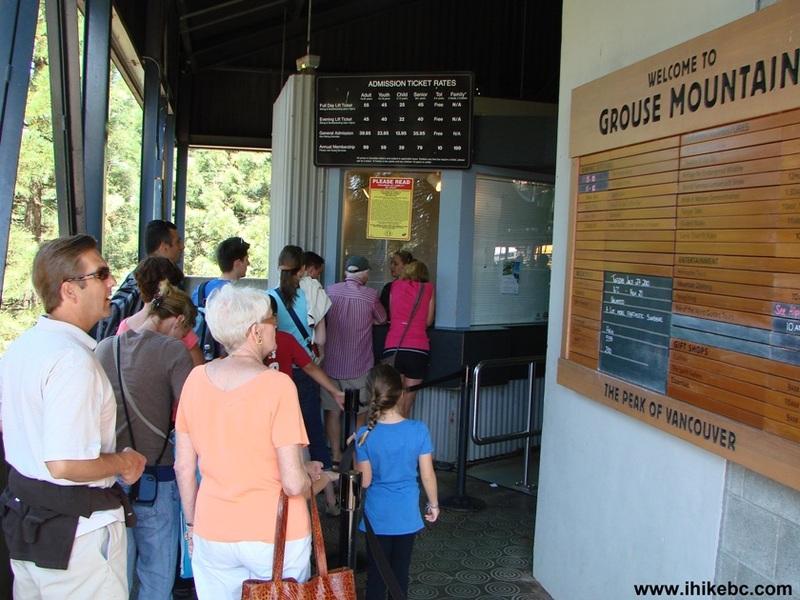 Grouse Mountain also offers a free shuttle service, but there still is the possibility of lineups. If you decide to take public transit, you may have to wait to catch the bus at Lonsdale Quay Market. Not only are there line-ups for the bus, don’t forget the lineups at the Capilano Suspension Bridge or Grouse Mountain once you arrive! When taking a sightseeing tour, you get priority entrance, as the attraction ticket is included with the cost of your tour. Landsea Tours & Adventures offers hotel specific pick up and drop off at accommodations in downtown Vancouver, Richmond, and North Vancouver. 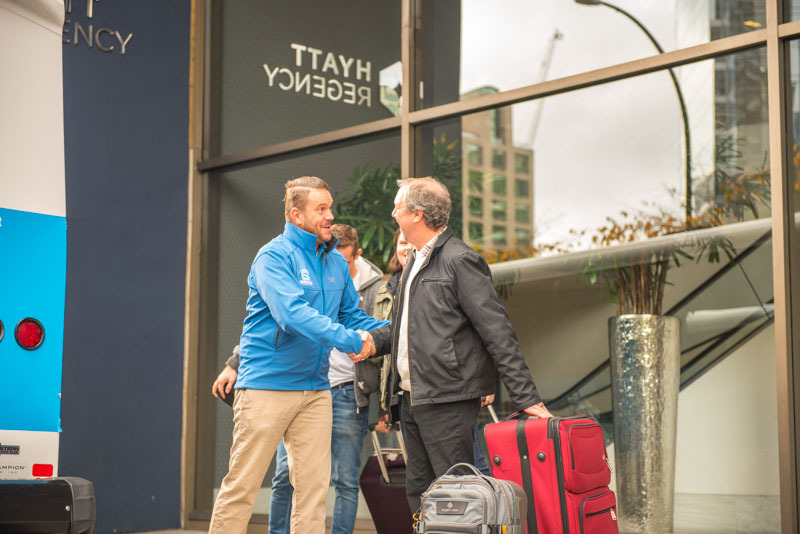 Your tour guide will pick you up from the lobby of your hotel on the morning of your tour, meaning no need to find the seabus station or a shuttle stop! After a fun day on the North Shore, you will have your seat on our air-conditioned mini-coach to rest your feet while you head back downtown. Embarking or disembarking a cruise ship? Landsea Tours & Adventures offers our pre-cruise Peak & Canyon Tour and our post-cruise Mountain Discovery Tour. We will pick you up from you hotel or cruise ship in the morning and take you out for a day of adventure! 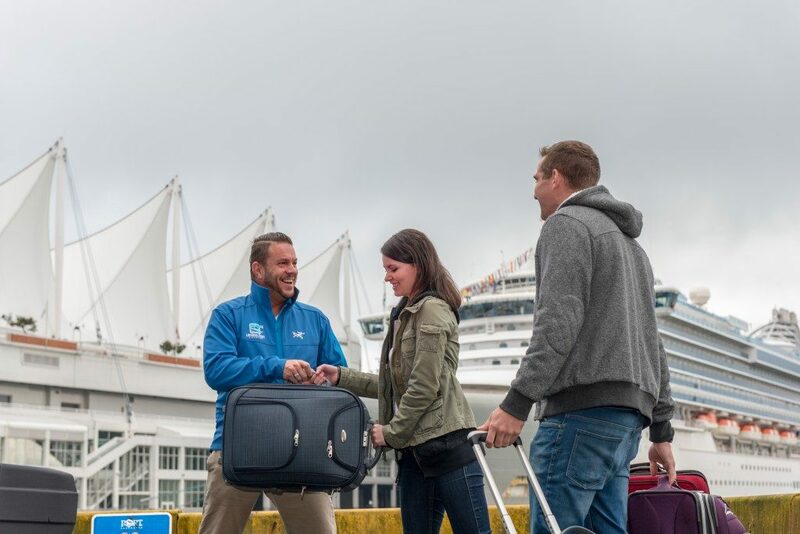 One benefit of a pre- or post-cruise tour is that we will take care of your luggage for the day. This means you do not have to worry about carrying it around or storing it. 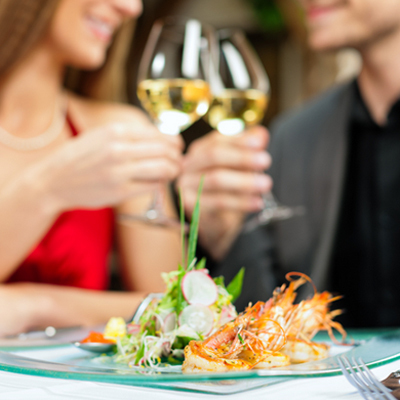 Have a flight in the evening from the Vancouver International Airport? Depending on the tour and the time of your departure flight, we will drop you off at the airport with your luggage. Instead of getting lost in the crowd, make a few friends along the way while taking part in our small group tours. 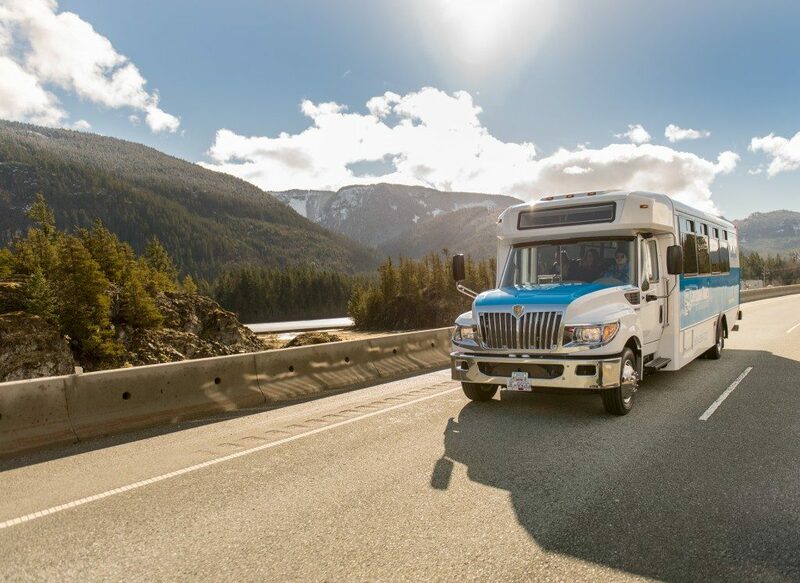 Our mini-coaches accommodate 24 to 30 passengers, which allows for easier bonding with your group and to have a personal relationship with your tour guide. You will also receive personal recommendations on what to see and do at each attraction and a customized commentary from your guide resulting in a fun-filled entertaining day. On our Mountain Discovery tour, an extra stop is included at the Capilano Fish Hatchery, where visitors can see and learn how fish develop from eggs to the juvenile stage. With a sightseeing tour, you don’t have to worry about a bus being full or behind schedule resulting in a missed bus. Our tour guides will let you know how long you have at each attraction and where to meet when you are done, so you don’t have to stress about catching a bus back home. Lastly, you can rest assured that if you have evening plans that you will be back in time with your guaranteed seat on a mini-coach.